This programme is closely linked with research activities within electrical and electronic engineering. Our research in advanced technologies aims to develop state-of-the-art algorithms with a large variety of applications. Recent applications of these technologies include the development of a coded track circuit, an advanced signalling system for train detection and safety, developed in collaboration with the global company Bombardier. As part of their work the researchers collaborate with numerous UK and international companies. Collaborations include companies in the USA and universities in Europe, New Zealand and the USA. 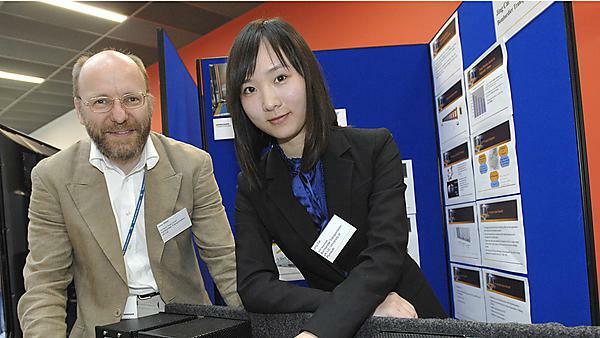 Pictured - Andy Millar, Engineering Design Manager, Bombardier Transportation, and Jing Cai who previously worked for Bombardier Transportation as a Design Engineer.